What is passive voice and why should you avoid using it in your writing? Whenever I edit or proofread a text or manuscript, one of the most common corrections I have to make is to turn passive and causative forms into active sentences. Yes, I use passive resistance against the passive! It is almost always better to use the active voice instead of the passive voice because it clarifies who or what is performing the action of the verb on the object. Using the active voice allows a writer to describe people, places, things and reasons in much more detail. A story or an article resonates better with a reader when they know exactly what, when, where, who, how and why. In active voice, the subject performs the action of the verb. By contrast, the passive is like scientific writing; quite cold and devoid of information or vivid detail. This is because the grammatical subject of the sentence does not perform the action. But to avoid using passive forms, you first need to know how to recognise voice construction, and then how to change them into more detailed active sentences. The basic form of the passive is the verb to be + past participle in all tenses. 2. What Is Passive Voice In The Causative Form? 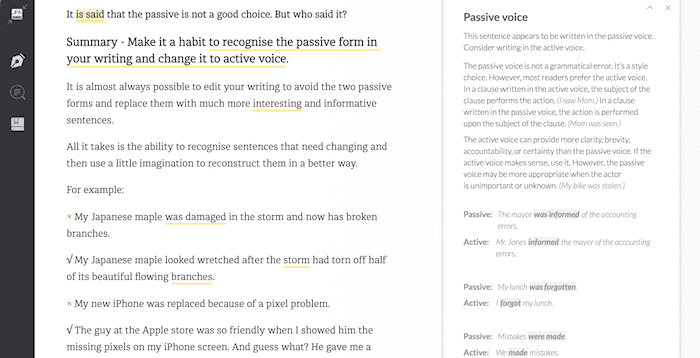 Summary – Make it a habit to recognise the passive form in your writing and change it to active voice. It is said that the passive voice is not a good choice. But who said it? Here is a very basic example of active and passive. Passive: The meeting was cancelled due to a train strike. Active: Our manager cancelled the meeting because of the train strike. In the passive sentence, we do not know who cancelled the meeting but in the active sentence we know it was the manager. The use of due to is common in passive forms but because is more informal and suits the active form better. In general, the passive form is far less informative than the active form. This is why active voice is the preferred style in good communicative writing. Active: He was confused. Meaning he wasn’t sure or couldn’t make up his own mind. Passive: He was confused (by something or someone). His manager told him to do one thing, but his director told him to do another. Active: They were relaxed. They were in a state of relaxation. Passive: They were relaxed (by something or someone). The music helped them to relax. The way to differentiate between the two is to understand if there is or can be an operator. In passive form, the preposition by indicates that the subject receives the action from the operator. If it is the adjective form, there is no operator because it is describing the subject of the sentence. Use of the passive can also create awkward sentences, especially when used with a prepositional phrase. Active: Martin abided by the decision. Passive: The decision was abided by. Active: The burglar broke into the bank. Passive: The bank was broken into. The sentences above show why you should avoid the passive when there are dependent prepositions. When the form of the verb is a phrasal verb with one or sometimes two particles, it can really become very ridiculous. Here is a grammatically perfect example of the passive that is cumbersome. Active: David and Roger got down to business. Passive. Business was got down to. Clarity in writing comes from being precise about who performs the action, which can then be described in far more detail. To achieve this, it is best to start a sentence with a verb phrase and avoid using an inanimate noun as the subject of a sentence. In the example above, choosing between active or passive voice is easy because writing about the burglar would be much more interesting than writing in vague boring terms about a bank. Causative forms are similar to passive voice in that there is usually an invisible operator. There are two causative structures. Generally, it is called have something done, when you have or get another person to do something, or want someone to do something. Here are some causative examples, including some using auxiliary verbs. Mary has her hair cut every two months. Joe got his car serviced last Tuesday. He had his computer replaced under guarantee. I am having my teeth cleaned on Monday. She’s getting her hair done before the wedding. As with the passive, an operator can be added, but it is rare to do so. Mary has her hair cut every two months by her hair stylist. He had his computer replaced under guarantee by Apple. What’s the difference between, have and get + object – past participle? We use have when something is arranged for someone, and with get, it expresses the idea that the subject is in some way involved. I am having my teeth cleaned on Monday. This says that someone else, and in this case, the dentist is doing everything. Joe got his car serviced last Tuesday. By using get, it indicates that Joe was perhaps in some way involved by either taking his car to the garage and waiting there, or possibly even participating in the service. The causative is also very often used when the subject has paid someone to perform an action. Anytime you notice that you are using the causative verb or form of verbs, think about trying to express it in another way. By doing this, you can remove the simple use of cause something and rewrite it with more descriptive elements. Mary goes to her hairdresser every two months because she likes to keep her hair very short. Sometimes it seems quicker and easier to use the passive or causative. However, it usually lacks detail or explanation. It is much better to rewrite these sentences in active form and add more compelling detail. I always use Grammarly to check my texts after I have finished writing my first draft. But you can use almost any decent grammar check to do the same. The first thing I do is look for passive voice sentences and make sure that I replace every one that is possible to change. More reading: What’s the difference between simile and metaphor? It is almost always possible to edit your writing to avoid the two passive forms and replace them with much more exciting and informative sentences. All it takes is the ability to recognise sentences that need changing and then use a little imagination to reconstruct them in a much better way. Adding a transitive verb often helps. × My Japanese maple was damaged in the storm and now has broken branches. √ My Japanese maple looked wretched after the storm had torn off half of its beautiful flowing branches. × My new iPhone was replaced because of a pixel problem. √ The guy at the Apple store was so friendly when I showed him the missing pixels on my iPhone screen. And guess what? He gave me a brand new phone on the spot and didn’t even ask for my receipt. × I have been told that coffee is good for you. √ I read an article in Popular Science a few days ago that explained all about a huge research project that proves that coffee is good for you. To round off this article, here are a few of my favourite quotes about why the passive should be avoided in all forms of writing. More grammar: What Is The Subjunctive Mood And When Should You Use It? A great article. I have to actively concentrate on this when I write but it is becoming more natural with practice. Agree with everything you say above – in English. Some languages insist on the passive – Welsh for instance – I know you don’t write in Welsh so this is for casualinfoonly and obviously doesn’t relate to English. In Welsh you can’t say the equivalent of “I was born in London.” Because you didn’tdo the action (obviously). You have to say the equivalent of “I had my birthing in London.” Which throws the action back on the doer. Just saying, to add to the mix. Great article. I write science and yes, it is easy to fall into the trap of the passive voice. Thank you for such an informative article. You’ve been looking over my shoulder. This is a real weakness for me. I spend way too much time going back and correcting my passive sentences. Maybe someday, the light will come on. Thanks for a great post. Great article. I often fall to passive writing in drafts and fix later. Should I Stay In Kindle KDP Select Or Open Publish?